Earlier this summer I was asked to provide a vegan dessert for a party. I already had some homemade sorbet on hand — I’ll post about that at another time — but I wanted something more traditionally sweet as well. 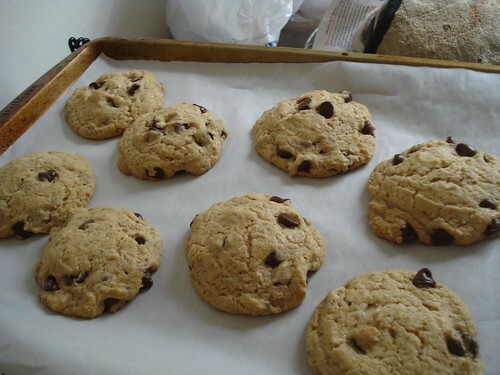 So I searched for some recipes and found this list of Oh She Glows’ top 21 vegan desserts of 2011, and on it found this recipe for vegan chocolate chip cookies, and so I tried it. 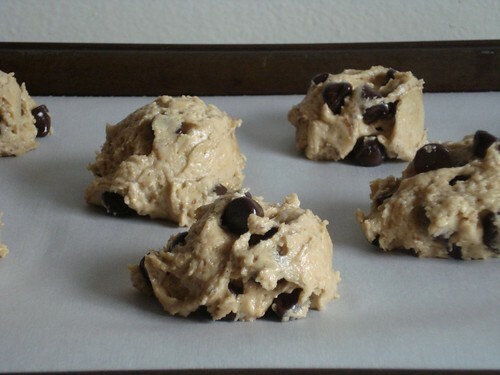 This particular recipe is a pretty simple substitution project: replace the butter with a vegan spread, replace the eggs with flaxseed and water, and make sure the chocolate chips don’t have dairy. As for the chocolate, semisweet chocolate chips should be made without dairy, or you can get a fancy high-cocoa chocolate bar without dairy and chunk it up. Check the ingredient list. I used Trader Joe’s semisweet chips. 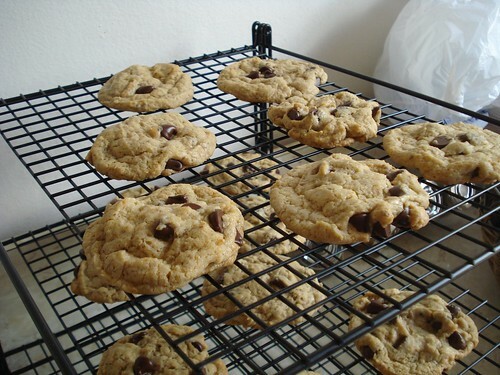 If you’re experienced with baking chocolate chip cookies, this one will be easy as pie. The only variation in technique from the regular recipe is for the flaxseed egg. 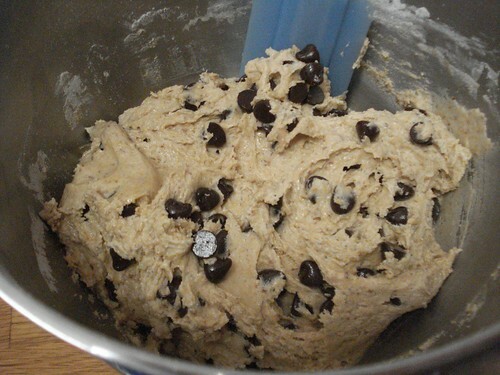 In a cookie, eggs provide binding and texture as well as supporting the leavening provided by the salt and soda. The flaxseed substitution — 1 tablespoon of ground flaxseed plus 3 tablespoons of water to make 1 egg equivalent — provides excellent binding and just a tad less leavening, which means that your cookies will sink a wee bit more as they cool than the non-vegan kind will. This is not a bad thing by any means. The cookies were a big hit at the party. I want to make them again but I think next time I’ll cut the cinnamon and bump up the vanilla. The cinnamon, I think, is intended to help mask the absence of a strong buttery taste, but it was a little more cinnamon than I wanted; I think vanilla will fill that hole nicely. I could add a drop of almond extract too, though not more — a little of that goes a very long way. 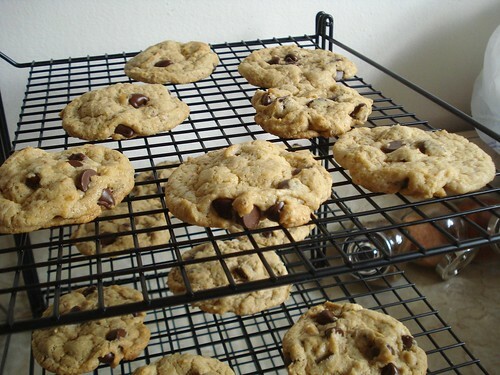 So I heartily encourage you to surprise the vegans in your life with fresh-baked cookies. And at some point, perhaps closer to the holidays, I plan to build on this to see if I can make vegan Igor Bars. I can hardly believe it’s been about four years since I last posted here. Well, I can believe it, it’s just embarrassing. But I am reviving the blogs, and will be sharing more of the yum. And what exactly is Recipes of the Yum? At its simplest it’s a counterpoint to Recipes of the Damned, but it’s also a celebration of good food. My preferred focus will be food I’m cooking — that’s the “recipes” part, after all — but I will not hesitate to post great food photos from my excursions out and about. And the Yum is democratic, small-d. Or ecumenical. Inclusive. I don’t generally have the budget for filet mignon and fancy restaurants, but they’ll appear here if I get the chance. As will simple home cooking, or particularly good retail bakery offerings, or taco truck. (You would not believe the taco truck in our neighborhood. The sauce! The rojo sauce should be sold on its own. Or licensed, or given away free as a jump-start to world peace.) I have my snobbery but it’s quirky and individual, and I try not to impose it on others. So, welcome back to the Yum. I’ll be catching up with some recent cooking, and pointing to my new Zazzle store, Little Shop of the Yum, which will feature my photos. You can check those out on my Flickr page, and if you see something you’d love to buy as a mug or postcard or something, let me know! My apologies for going so long without posting. I will be too occupied to post here for about another week, but then expect to catch up. In the meantime, please go check out my newest blog, 107 Cookbooks, in which I am cooking at least one thing from each of my 107 cookbooks by June 30, 2010. Check it out! I squeezed on some lemon and sprinkled on a bit of spice and sugar. 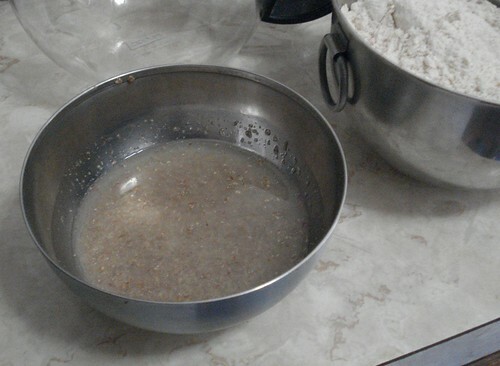 Then I added a topping of rolled oats, flour, brown sugar and butter. Baked it at 375 for about 35 minutes; I could probably have let it go a bit longer but it was looking very bubbly and I didn’t want to risk burning. Tonight I had a chance to cook with the cast-iron grill pan; it’s been a while since the weather has been pleasant enough to make it seem sensible. So I decided to grill chicken thighs, which I rubbed with a mixture of spices: ground ginger, turmeric, oregano, basil, garlic powder, salt, pepper and paprika, plus some lemon zest. I can’t tell you the amounts; I just fiddled with quantities until it smelled right and I had enough in the bowl to coat all six pieces. I also did corn on the cob–the ears came pre-shucked at the produce stand or I’d have done them in the husk. I also made a side dish of soba with kale. You start by boiling some soba noodles until they’re almost done (you could use udon too) and then draining them and setting them aside. Rinse and stem the kale, and chop it into modestly sized pieces; some of the water should cling to the pieces, or you can tip the water from the cutting board into the bowl. Not a lot, just maybe a tablespoon’s worth. Heat a skilled with some toasted sesame oil; when it’s fairly hot, add a couple of minced cloves of garlic and roughly half a teaspoon of red pepper flakes, and saute for a few minutes until the garlic starts to look a bit toasty. (I would say until it smells good, but seriously once you open the bottle of sesame oil you’re already at that point.) Then add the kale–carefully, getting a fair number of pieces into the pan first before any water can hit the hot oil. If the kale is overloading the pan, let some wilt a bit before adding more pieces, which won’t take long. Toss the kale with the garlic and red pepper, then cover the pan, lower the heat and let steam for about 5 minutes. Then add the soba and toss it together so the kale, garlic and red pepper flakes are well distributed among the noodles; use two forks if necessary to get the noodles separated. Keep on the heat for a minute or two more, then serve. Sorry for the long hiatus; I was on vacation and didn’t find time to post anything, though you can find some pictures at my Flickr site (including of some good food we enjoyed). We got home last night and I was happy to be back in the kitchen this evening. Now that the warm weather is upon us I will be more regularly doing the home version of a salad bar. We have a lovely Tupperware salad bowl that we got for our wedding all those years ago, and it does a great job of keeping lettuce fresh. We have adopted a habit of keeping the different salad ingredients in separate containers (so that when your cucumber goes bad in a few days — and it will — it doesn’t take the rest of the salad with it). So I tore up lettuce leaves and chopped up a few other items. Then I got to work on Chili Burgers, a recipe from Moosewood Restaurant Low-Fat Favorites. You start by sauteeing onions and garlic in olive oil, then adding shredded carrot, chili powder and cumin. Meantime, you drain and rinse canned red kidney beans (1 30-ounce can or 2 15-ounce cans), though of course you could also use the equivalent quantity cooked from scratch and cooled. You mash the beans with a potato masher, then add 2 tablespoons each of Dijon mustard, soy sauce and ketchup. Then mix in the sauteed vegetables. Add 1 1/2 cups of rolled oats and mix well, then shape into 8 patties. At this point in today’s cooking I wrapped four of the patties in wax paper and then aluminum foil and stuck them in the freezer; they cook wonderfully from frozen. I heated some olive oil in a pan and cooked the remaining four patties about 6 minutes on each side. I rounded out the meal with salad and corn on the cob. Because “Julie & Julia” will be opening. Who’s in NYC who’d like to get together and go on opening night? Recently I read Mark Bittman’s new book Food Matters: A Guide to Conscious Eating. Bittman gives a lot of good background for why one should reduce one’s consumption of processed foods and of meat in particular, and he describes the strategy that he adopted for doing, so, which he calls “Vegan Before 6”: quite simply, he eats no animal products (meat, dairy or eggs) before 6 p.m., and then eats whatever he feels like after that. Of course, as he notes, there are other ways to change your eating habits, but this is fairly simple. Nothing is forbidden; you just have to wait until 6 p.m. to eat certain things, which is not a great hardship. You can make exemptions; he allows himself to have milk in his coffee, for example, which makes it more likely that he’ll keep the rest of his pre-6-p.m. diet vegan. And he found that after he had adopted this habit for a while, he was far more likely to minimize the amount of meat or dairy in his dinner as well. Bittman says he lost more than 35 pounds before he stopped weighing in and started focusing more on his overall health and the fit of his clothes. The other part of his plan — possibly the more important part — is to cut out processed foods. This goes together with the vegan portion of the day, really, since it’s far easier to ensure a dish is vegan when you assemble it from fresh ingredients than if you have to analyze ingredient labels on packaged food. It also means that knowing how to cook is fairly important, and is probably where most American readers would become resistant (if they hadn’t already freaked out at the term “vegan” and assumed they were being asked to move to communes and start wearing hemp clothing exclusively). I’m very lucky: The building I work in recently opened a very good (and inexpensive) staff cafeteria. If I come in from my pre-work gym visit and want something to hold me until lunch, I can toast bread and spread it with chunky peanut butter, and buy diced fruit by weight. If I want lunch, there’s a large and diverse salad bar, and the “action station” often features stir-fry with tofu as the protein. I have a lot of great options. If I get too fretful about the question of whether the bread at the toast station might be made with casein and I want to have greater control, I can pack my own food pretty easily. I’ve been trying this for about two weeks now, with very little slip-up; one day I brought in leftovers from a pasta salad that had feta, and today I ate a leftover slice of the pizza I made last night. We also had one weekend day when we felt like following our old habit of going out for a diner breakfast of eggs and bacon, but we decided that day would be “vegan after breakfast” instead of “vegan before 6.” Easy as pie. What is interesting to me is that I’ve had a couple of other situations where I was tempted to break the “vegan” rule and found it not very difficult to stay firm — not because I was strict about it but because I had specifically decided that I was not going to beat myself up about it if I broke the rule. I think that’s really a key: For some people, a rigid rule is an effective guide, but for others it’s a provocation, and it helps to understand your own personality here before you try to make any change in your food habits. I haven’t really lost any significant weight, but I am feeling good. I will continue to post occasional updates, especially if I do start to take off weight. And I’ll be looking more diligently for vegan recipes to share. I made pizza last night. We had watched an episode of Food Detectives that investigated whether the water in New York City pizza crust makes a difference (it does), and that made me itchy to make dough. So I decided to try a thin crust base. I hand-pushed and manipulated the dough more than I rolled it, and the base of the pizza was fairly thin, but the edges were still thick — sort of a hybrid of deep-dish and thin crust. I think to try a real thin crust I need to either make a 3/4 size batch of dough or get a baking stone, or perhaps both. I laid on a moderate base of sauce and topped it with Yves veggie pepperoni, sliced kalamata olives, and plenty of mozzarella. It was very good. It’s been a while since I posted and I’m going to do a series of relatively short posts rather than one encyclopedic one. So this is a short cooking-oriented post, a stir-fry I made the other week. I sliced and salted half an eggplant and let it stand a bit, then rinsed and dried the slices and cubed them. I also chopped up some other vegetables, including mushrooms, broccoli, bell pepper and onions. I didn’t feel like adding meat or egg and I didn’t have any tofu, so for a bit of protein I made a peanut butter sauce, a mixture of peanut butter, hot chili sauce and soy sauce, eyeballing the proportions and mixing until the smell was right and the consistency seemed to be what I wanted. Still no wok. I added vegetables in ones or twos to cook, adding the broccoli fairly late (when the pan was fairly full and the vegetables would be putting off a fair bit of steam) and letting it cook a few minutes before adding the sauce. Then I mixed in the sauce and let it all cook together a bit. I added some red bell pepper and parsley and let it cook for just a moment or two longer before I served it up over rice.